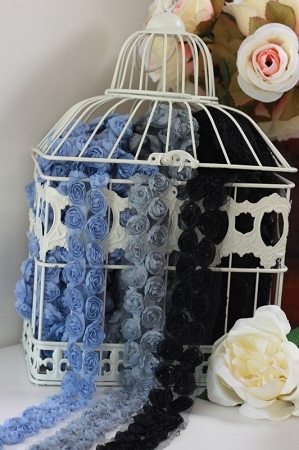 These sweet little rosettes are the perfect addition to a variety of crafts. Simply sew along the mesh base, keeping close to the rosette, then trim the mesh off when finished. Alternatively glue them to your craft. You are purchasing a meter of your selected colour. Each rose is approx 1.5cm. Colours: as shown but please also see the other listing for more colours. If no colour is selected I will send colour at random. To purchase multiple colours, please add each one individually to your cart. Simply click on 'Continue Shopping' to be brought back to this page. Postage/handling is added at checkout. If you are overcharged, please note that I refund the difference asap. Min postage/handling is $2.50, larger packages are $8.00. Pre-orders are sent separately to items in stock & thus require extra postage which is automatically calculated. Registered post is an extra $3 if requested.